A good canapé recipe is handy to have up your sleeve for dinner parties and other get-togethers where finger food and bite-sized snacks are preferred over full-on plated meals. Cheese canapés are always a favourite party nibble. Bruno Loubet's Roquefort and cranberry endive is a really easy canapé to make and a real winner in both looks and taste. Fritters, croquettes or beignets are great to have on offer. 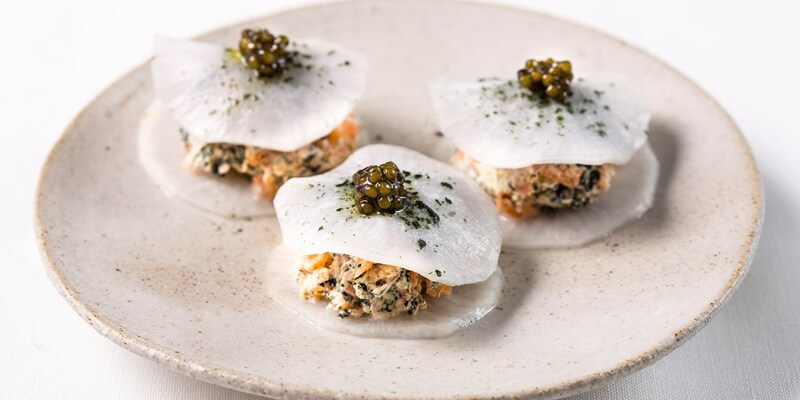 Martin Wishart's Smoked haddock croquettes with pea purée would be wonderful at a summer garden party, whilst Galton Blackiston's Cheddar beignets with sesame dressing would be a great vegetarian canapé option. Crab, oysters and other seafood are wonderful to tease into pâtés, place onto crispbreads or wrap up in pastry, lettuce or bacon. Adam Gray's Cornish crab with pink grapefruit mayonnaise makes a lovely party dip, while Salmon gravlax with horseradish from Agnar Sverrisson is a piquant bite your guests will delight in. For a playful canapé idea, try Josh Eggleton’s signature Scallop pops – fuss-free but full of flavour. Lisa Goodwin-Allen's Turkey sausage meat puff pastry canapés would also make a wonderful festive snack, if you are looking for Christmas canapés to entertain your guests.